Imagine if Rob Zombie, Marilyn Manson, and Alice Cooper had a grandmother that fronted a rock band...enter GRANNY 4 BARREL! A Neo-Victorian steampunk shock rock nightmare - she is the Matriarch of Metal! 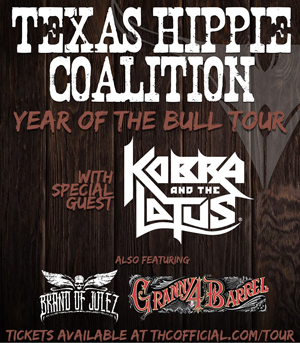 And soon, Granny will be rocking the USA - on a killer bill that also includes TEXAS HIPPIE COALITION and KOBRA AND THE LOTUS. Kicking off on April 19th in Salt Lake City, Utah, the tour will crisscross the states until June 3rd, when the tour wraps up in Austin, Texas. To see the visual proof, you can view the video on KNAC.COM HERE.